If your child has Obsessive-Compulsive Disorder or is exhibiting symptoms that could be OCD, he or she is not alone. Current estimates suggest that one in 100 children has OCD, which means that millions of children worldwide are suffering from this disorder. When you include parents, other family members, friends, and school personnel who are affected by a child with OCD, this unwanted condition has an impact on many millions more. OCD is not a “phase” your child is going through. And your son or daughter isn’t deliberately misbehaving or trying to get attention. Your child is not to blame. Perhaps most importantly, it’s not your fault that your child has OCD. OCD is a neurobiological disorder, which means that the brain of a child with OCD functions differently than the brain of a child who does not have OCD. 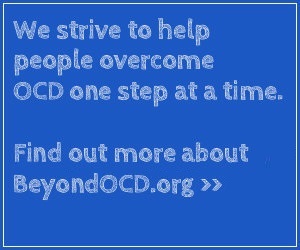 Beyond OCD wants to help you get the information you need to help. You and your child deserve to get relief from an illness that is affecting the pleasures of childhood, normal family life, friendships, and schoolwork. Fortunately, effective treatment is available, and you can look forward to the future with optimism. With proper treatment, your child can learn to manage the symptoms of OCD. OCD is a disorder that has a neurobiological basis. This brain condition affects how children (and adults) think. It is characterized by obsessions and compulsions that take up at least an hour a day. For many people, however, obsessions and compulsions consume several hours a day. Obsessions are involuntary intrusive thoughts, images or impulses that cause unbearable worry, fear or discomfort. To cope with the obsessions, the OCD sufferer devises processes or actions called compulsions, or rituals. In some cases, rituals are observable: a child washes his or her hands excessively or checks locks for extensive periods of time. In other cases, compulsions may be completed mentally and cannot be detected by an outside observer: the child is saying a prayer mentally to prevent something terrible from happening. These repetitive, ritualistic acts make a child feel better, but the relief is only temporary. Currently, there is no cure for OCD; it’s a chronic condition. However, much like the child with asthma, allergies or diabetes learns how to manage his or her condition with proper treatment, a child with OCD can learn how to manage the symptoms of OCD. Children sometimes describe their obsessions as “bad thoughts” or fears or worries. And in some cases, they have a very hard time describing or putting into words what it is that is bothering them. But they feel compelled to engage in rituals that help to reduce their anxiety or discomfort – albeit temporarily. As an example, a child may have an intense, recurring fear of someone breaking into the house and harming someone in the family. This fear is the obsession. The child may insist on repeatedly checking that the doors and windows are locked at bedtime, or ask the parents to check other areas over and over again. Those repetitive acts are compulsions or rituals. While safety fears are not uncommon in children, persistent and escalating fears about these matters can be very upsetting, causing a child great distress. Another common obsession is a fear of germs, which is frequently followed by compulsive hand washing – hand washing that occurs so often or takes up so much time that the child’s skin is raw. As a parent, it’s critical that you be able to recognize the symptoms of OCD as a first step toward helping your child gain relief. It’s natural for parents to look for the cause of OCD when they see their child suffering from this disorder. Parents often blame themselves or wonder what they did “wrong” to cause this often heartbreaking problem. Unfortunately, family members, neighbors or friends may reinforce this concern. But parenting is not to blame. Millions of people around the world have OCD. In the U.S., current estimates are that approximately 1 in 40 adults and 1 in 100 children suffer from this potentially debilitating disorder. No laboratory test can identify OCD, but a mental health professional who is knowledgeable about this disorder can conduct a specific type of interview and gather other information to determine whether a child has OCD. What Other Disorders Might Co-exist with My Child’s OCD? What Treatment is Effective for OCD? While there is no cure for OCD, getting relief from OCD is possible with Cognitive Behavior Therapy (CBT), sometimes in combination with medication. CBT has received broad scientific support as the most effective behavioral treatment for OCD. It is recommended by nationally-recognized institutions such as the American Academy for Child and Adolescent Psychiatry, National Institutes of Mental Health, Mayo Clinic and Harvard Medical School. How Can I Find the Right Therapist? It’s important to talk with your doctor if you believe your child has OCD. Ask for a referral to a cognitive behavioral therapist who is experienced in treating children or teens with OCD. The personnel at your child’s school may also have some suggestions. Beyond OCD can help you locate professionals who work with young people and are trained in CBT, as well. Medication can play an important role in treating children who have OCD. It’s not recommended by experts as the first line of treatment for OCD, but in some cases, your child may need both Cognitive Behavior Therapy and medication to gain relief. A doctor may prescribe medication, for example, for a child who has moderate to severe OCD or OCD with coexisting depression. In many cases, medications are used on a temporary basis until he or she is able to manage the disorder with therapy alone. Once the child is better able to handle anxiety and stress during CBT, or his or her level of depression has been reduced, medication may be gradually decreased; in some cases, it can be eliminated. Parents should learn as much as possible about medications; if drugs are prescribed, you’ll understand the benefits and cautions of this kind of treatment. Being knowledgeable about OCD is a powerful tool that’s linked to success in treating this disorder. Understanding barriers to treatment and knowing what to expect ahead of time are extremely important to the success of your child’s treatment. Parents play a crucial role in helping their children get relief from OCD. From initially noticing that something is wrong with their child through treatment and beyond, parents can help – or hinder – a child’s progress in getting and maintaining relief from OCD. Symptoms of OCD may be obvious at school. But even if your child hides his or her OCD during school hours, the disorder may be negatively affecting him or her academically, socially, emotionally, or behaviorally. The decision about whether to tell your child’s teachers about OCD is a personal one. But it’s important to know that there are benefits to informing school personnel about your son’s or daughter’s OCD. You’ll need to weigh the benefits of openness against privacy and other concerns. Also, keep in mind that teachers may be informed to a greater or lesser extent about what OCD is and how they can help your child function in the school setting. You may need to play an active role in educating school personnel about OCD or finding other resources (e.g., books, films, websites, guest speakers) to help them learn about OCD. This website contains numerous sources to help you in this regard. Your child may also be eligible for accommodations or special education and related services under various federal laws that pertain to children with disabilities. Your adolescent with OCD may test your patience as he or she struggles with OCD. Symptoms of this disorder may be causing him or her great distress, yet he or she may be unwilling to admit that outside help is necessary. It’s important to know that teens can – and must – be active participants in recovery from OCD. They have to be willing to engage in Cognitive Behavior Therapy and recognize it as something that can help them overcome OCD rather than as one more thing their parents are telling them to do! We’ve created a special section that you can share with your teen, to help him or her learn about OCD, its treatment, and his or her power to help themselves. The expenses associated with OCD treatment may be financially challenging. If you’re concerned about being able to afford treatment, you may need to look for ways to reduce costs. Fortunately, effective treatment usually isn’t a long-term expense. If your child commits to working hard with a therapist and doing the prescribed homework between treatment sessions, significant improvement can generally occur in a matter of months. The benefits of treating OCD outweigh most short-term financial challenges. Without treatment, individuals with OCD rarely get better on their own; the disorder simply doesn’t work that way. In fact, left untreated, it frequently gets worse.